The image below shows the layout of the game board. 1. New Game Button. Pressing the Deal button deals the cards for a new game. You can also deal the cards by clicking on the deck in the upper-left-hand corner at the beginning of the game. If a game is already in progress, you will be prompted to choose between starting a new game or restarting the current game. 2. Undo Button. Pressing the Undo Button, will undo the last move. You can undo the last 500 moves. 3. Home Row. The Home Row consists of eight pockets. When you have completed sequence of all 13 cards in the proper order and all the same suit, the sequence can be moved to an empty pocket in the Home row. 4. Deck. The Deck is the pile of cards that haven't been played yet. Clicking on the Deck, will cause the cards to be dealt. If it is the initial deal, the program will deal 54 cards in the Arachnids pattern. From then on, the program deals 10 cards at a time, one for each column. Note you can only deal if there are no empty columns. 5. The Pile. The Pile is the main playing area of the game. 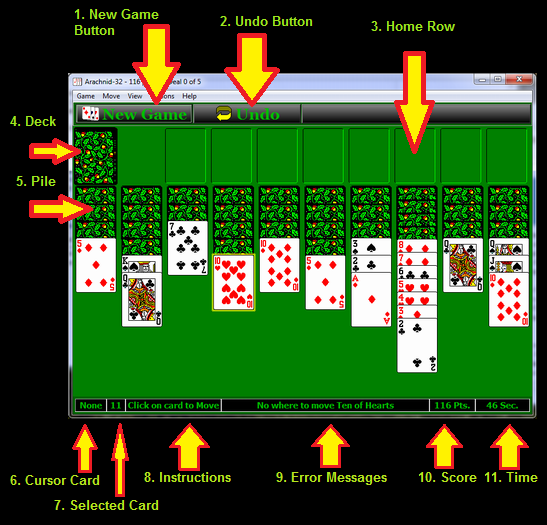 The game is played by organizing the columns of cards in sequences from King down to Ace. You do this by moving a card from the bottom of one column to a different column whose bottom card is one higher. For example, you can move a Three at from bottom of one column to a Four a different column. The cards may be of different suits or they can be of the same suit. However, you can only move groups of cards together as a unit, if 1) they are all the same suit, 2) they are in the proper orders and 3) they are at at the bottom of a column. For example, you could move a group consisting of the 7, 8, and 9 of spades as long as they were at the bottom of a column. For more information on moving cards, refer to the rules of the game. 6. Cursor Card. This item displays the card under the mouse-cursor at any particular time. It is useful when you have a long column were the cards crowded together so you can see the value of the card. 7. Select Card. This item displays the currently selected and highlighted card. 9. Error Messages. This item displays error messages. 10. Score. This item displays the current score. 11. Time. This item displays the elapsed time since the game was started.